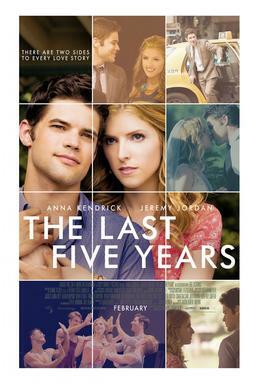 I love The Last Five Years, and I think Kendrick and Jordan play the roles well. Unfortunately, the cool concept of one person’s story going reverse chronologically is lost on a lot of people because it’s not done well in this movie. If you didn’t know going in, you probably wouldn’t pick it up. On stage, it’s done a bit better because Cathy and Jamie stay on separate sides of the stage, only coming together at their wedding before crossing over and separating again. You mentioned that the songs all kind of sound similar, and you’re not wrong because there are a lot of repeating melodies and bits, but I’ve come to appreciate that more now that I know the soundtrack by heart and can differentiate between songs. All the staging stuff is really interesting and I didn’t know that. While I’ve not listened to the soundtrack in its entirety, I’ve listened to “Still Hurting” almost once a day since I watched the film so that song definitely made a lasting impression!